A stormwater detention tank is a tank designed to capture large volumes of rainwater which can accumulate quickly during a heavy downpour of rain, and consecutive downpours. The detention tank temporarily “detains” that water slowing down the rate of water entering the stormwater system, greatly assisting to prevent flooding. Detention tanks have an outlet that is always open so water can always escape. The rate at which the water escapes from the stormwater detention tank is relative to the diameter of the outlet (usually called an “orifice”) and the capacity and dimensions of the tank. Viking Plastics is renowned for the manufacture of quality trade waste tanks and bespoke plastic products. Viking combines state of the art plastic welding capabilities with Paneltim®, a unique 50mm lightweight cellular plastic construction panel, to fabricate each stormwater detention tank according to individual specifications. Tailored sizes and designs accommodate specific areas like basements in high rise apartments and other commercial building projects. 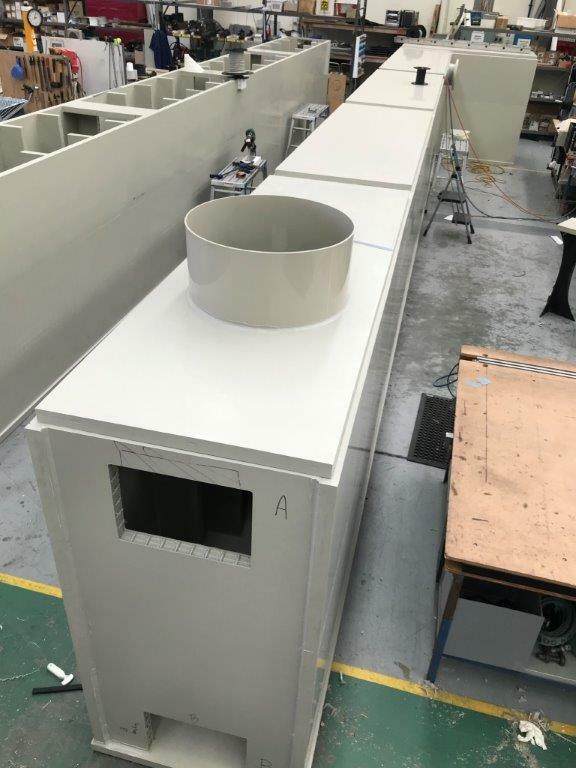 VCON contracted Viking Plastics to fabricate a triple-chamber 32,000 litre stormwater detention tank. The specification called for a 25 metre tank, 950mm wide and 1760mm high. The project at 535 Royal Parade, Parkville, is a residential apartment building that required the stormwater detention tank to slow the rate of stormwater into the drains. Utilising the Paneltim® plastic sandwich panels, Viking fabricated the 25 metre stormwater detention tank in two parts of equal length (12.5m) and width. The first tank had a right-angle portion at one end. The second was a single plain rectangle tank. The two tanks were designed to operate as one with water passing unimpeded between them. Corresponding holes were cut into the end of each tank. Both tanks were fitted with 600dia manhole access chutes. As the access chutes were telescopic in function, the length (height) of each chute was adjusted on site. The rectangle tank was fitted with an internal baffle wall with a 100mm diameter orifice at low level. The baffle holds back (retains) water entering the tank at a greater rate than can pass through the low level orifice. The sump on the downstream side of the baffle wall was fitted with a 315dia outlet pipe spigot at low level. Viking Plastics was on site for the delivery and unloading of the two tanks. Viking provided support and advice regarding unloading, placement and bringing the two tanks together in their final resting positions. The tanks were joined on site by two interconnecting transfer pipes and then welded together by Viking’s experienced plastic fabricators. Viking provided all the necessary welding equipment, tank access steps and tools necessary to complete the installation. All Viking Plastics’ products are fabricated in their modern, well equipped facility located in Braeside, Melbourne. Viking supplies products across Australia. Furthermore, Viking Plastics supply a full range of standard grease traps, trade waste tanks, fume cupboards, chemical resistant fume exhaust fans and, ventilation ducting and fittings for fume extraction. Got a project that requires bespoke plastic fabrication? There’s a good chance Viking will say “yes” and be the manufacturer you’re looking for. for advice or an obligation free quote.